Here is a lovely album containing some Sufi Musics from singers of Indian Subcontinent. This album features the biggest names in Sufi genre of Music. From Kawwali king and famous Pakistani Sufi Singer, Nusrat Fateh Ali Khan to Sufiana queen Abida Parveen, Indian icons such as Hans Raj Hans, Wadali Brothers, Rekha Bhardwaj and Zila Khan ... the compilations bring them all together in one great album. The spirit of the songs often transcend the distance and barrier of language. So enjoy the spiritual touch that is beyond, even if the language is foreign to you. 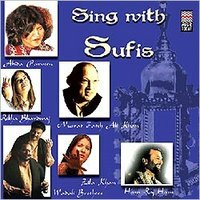 Here is the link of the album: Sing with the Sufis. Use Internet Explorer for listening the songs online. Other Indian Ghazal Musics (a special genre) are here.